These days, a lot of companies choose to hire a dedicated WordPress developer to create affordable and simple websites with interactive front-end components. The journey commences with finding someone you can trust at a rate you can afford. This typically translates into spending endless hours conducting conference calls, drafting long emails, and dealing with other unforeseen circumstances. However, the real issue lies in tugging the right strings that get clients bashing the digital doors. If you are looking to improve your UX, this article will give you all the nuggets to keep in mind as you sail these unchartered waters characterized by multiple rough edges. UI and UX are the most mistakenly and interchangeably used terms. However, UX places more emphasis on user experience whereas UI gravitates more towards the feel and information presentation on a website or an app. The basic goal of UX is to improve loyalty and customer satisfaction by leveraging on ease of use, and interaction with their website or app. What is a Good UX Anyway? In general terms, UX involves a people’s attitudes, emotions, and behaviors, when they are using a specific product. In reference to websites, it means that the website is valuable, effective, and easy to use for owners and visitors. If we give a small example of the WordPress board, the client should be able to log into their backend for the first and pick what’s going on in a snap. They must seamlessly find what they need and perform desired actions without emailing you in panic or reading through an endless list of manuals. The best website design should be performance oriented. As a UI coder, always focus on developing a website with minimalistic design as it impacts the on page speed at the same time affecting conversion rate. You don’t need multiple shades of different colors or even large background images. Slow page loading time on a website will end up frustrating users and ultimately cripple conversions. It also plays an important factor in determining whether they will be occasional visitors to the website. If they face undeserved user experience on the first visit, chances are high they will ignore it in the future. As a WordPress developer, having a clean HTML is the key to having a faster website. As a starting point, ensure the non-semantic elements in the HTML are renamed. Most often, developers get to some elements with non-semantic names which weighs on the CSS selectors. However, removing unnecessary elements and IDs to your HTML gives you a significant headway. Next, clean up the CSS by getting rid of inefficient selectors as they slow the page load. As an added bonus, efficient CSS selectors are easier to customize and redesign since they can be easily read in the stylesheet without losing the semantic meaning. Next, you need to shift your focus on treating your div-itis HTML. As a general rule of thumb, the cleaner these markup ends are, the more minimalistic your CSS will be. This not only gives you the flexibility for future customizations but also significantly reduces the page load time. Last but certainly not the least, create a reusable code. At the end of it all, you will appreciate the significant amount of time saved by these small CSS and HTML files. When making a request your browser is prompted to fetch a DNS record or any other file. To increase conversion rate optimization, have a clean markup in place to minimize the number of requests. As a result, the website visitors won’t have to wait for ages before the browser to bring back a report. Although a responsive website design calls for more images and CSS, faster load times can also be achieved by cutting requests from larger page sizes. As a front-end developer, the security of the website you create communicates a lot about your work. Users can only trust the website if they are assured of the safety of their important details like payment information saved on the website. This can only be guaranteed through great browsing experience compounded by features like the security seal. The first impression lasts forever. The most engaging colors of the overall website and its elements also play an important role in determining whether a visitor will engage or not. As a website owner, use the services of a UX designer who understands the psychology of a user and the user’s needs. For example, soothing colors tend to increase conversion. In 2017, the average web designer salary was $ 74,336 per year (the USA). This amount is expected to significantly increase globally in 2018. However, that’s not the interesting thing. In 2017 that more and more companies began to realize that the standard website design with hamburger menu is losing popularity and new trends appear. The personalized UX is becoming personalized as time progresses. More and more websites are beginning to deliver location-based and previous interaction emails and texts. Not surprisingly, this personalization trend will continue to be demanded by users in 2018. On the same breath, many website users already embrace chatbots and other conversational interfaces. However, such services require several taps which creates friction with the users. Websites and apps are beginning to combine UI elements and NLP to create hybrid conversational interfaces. Superimposing the virtual world into real-world imagery is no longer constrained into gaming apps such as Pokemon Go. Industry insiders like Mark Zuckerberg have predicted that conventional screens will be rendered useless by lenses. In 2018, innovative app and website designers will be looking for creative models to merge augmented reality into their projects. For example, there are apps that allow you to see how good a product will appear in your house before you actually purchase it. Two years ago, approximately 20 percent of mobile-related searches on Google were conducted using voice activation. Factoring in the number of smart devices and the rapid explosion of virtual assistants, this number is expected to hit 50 percent by the year 2020. A good number of companies have begun the migration from hamburger menus due to low discoverability and efficiency on UX. It’s an undeniable fact that hamburger menus are a popular trend. However, developers are beginning to flirt with alternatives in a bid to elevate the number of navigation menu clicks. Spotify is a good example which did away with the hamburger menu opting for tab-based navigation menu located at the bottom of the application. Companies are gravitating towards custom website design displaying all the info at ago rather that burying CTA’s and valuable content which can be can be detrimental. Additionally, hamburger menus increase bounce rate due to extended page load time. For the last few years, mobile browsing has continued to gain traction over desktop browsing which is influencing the modern website design. Design trends were initially meant for mobile but we are beginning to see some elements take shape in the desktop designs. Whether you are working with a WordPress website or any other website creation tool, the performance of your website greatly affects the users. 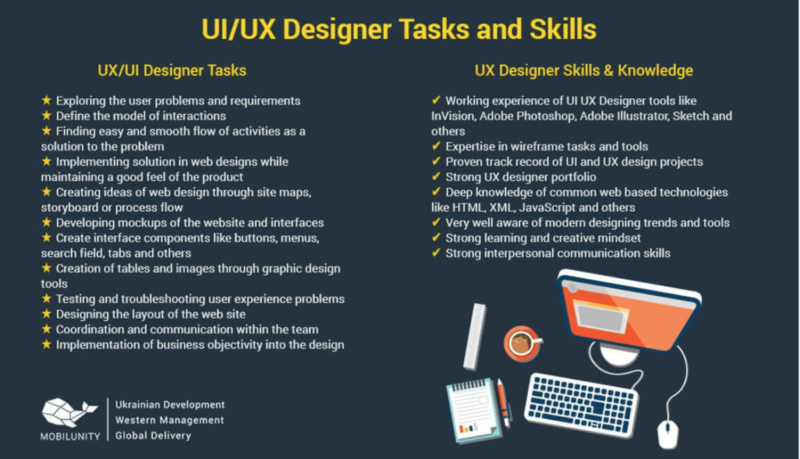 This demands a UI developer with a clear understanding of the job, how to measure it, and most importantly how to improve UX. This will lead to enhanced page load time, happier users, and better conversion rates.